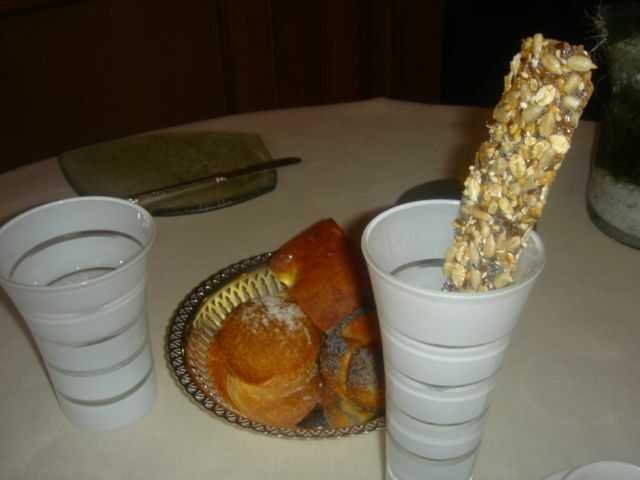 I debated and debated about my original lunch plan to go to Le Cerf in Marlenheim. Even though it is a 2 star, various food sites have reported horrible service and tired food, saying it is “totally over-rated and dated”. Bottom line – this just is NOT TRUE. Le Cerf was started in 1933 and the Chef, Michel Husser is the 4th generation to carry on the Le Cerf tradition. Daniel Krier, who is the GM will celebrate 29 years at Le Cerf next month. Our impressions are up to the minute — Le Cerf is not dated, not over-the-hill, not tired, and the service was exemplary. Chef Husser is one of the chefs like Passard, Kinch, Jardins Gourmand [Auxerre] who is committed to maintaining his own organic garden and sourcing the finest ingredients. 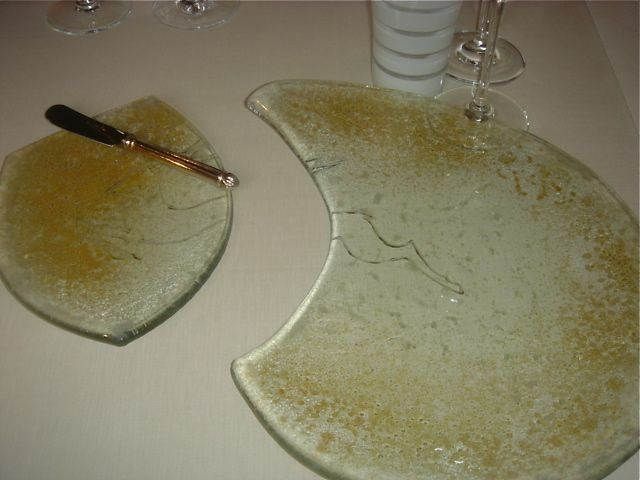 In retrospect, we wish we had ordered their discovery menu so we could have sampled the full repertoire of the Chef. 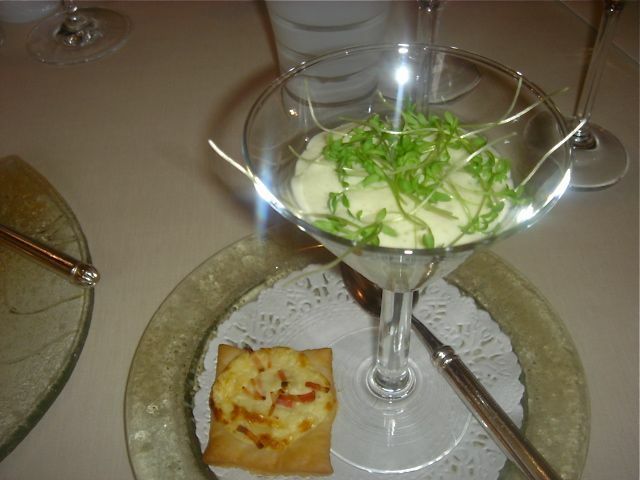 A mousseline of watercress with a small tart flambee on the side. Excellent beginning. Le tartare de coquilles St. Jacques de l’ile de Houat marinees a l’huile nouvelle d’Ampus, pommes “charlotte”, pistou a la mache. This was as beautiful to look at as it was to eat. Underneath the tartar were slices of potatoes [Charlotte presumably refers to molded]. 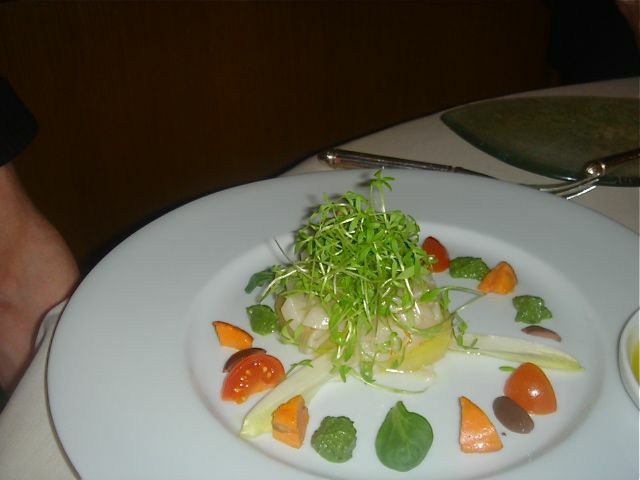 The scallops were diced about ¼” thick and marinated in an oil from Ampus. I can’t identify everything circling the tartare, but they included pistou, mache, tomatoes, nicoise olives, and endive. 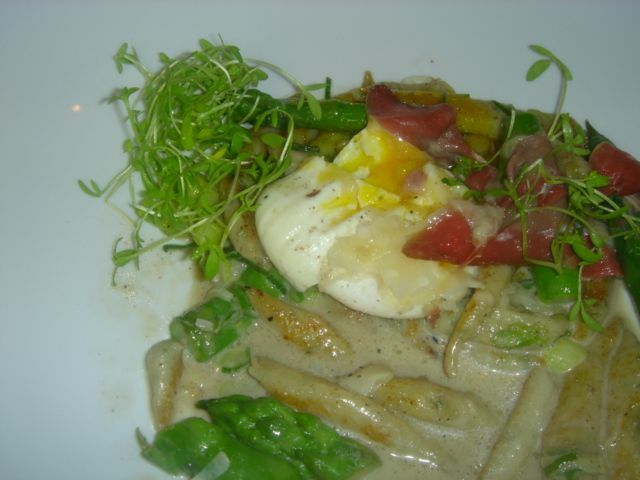 John–l’oeuf fermier poche fricassee de boewspaetzles et asperges vertes, jambon de canard, coulis a la truffe noir du Perigord. 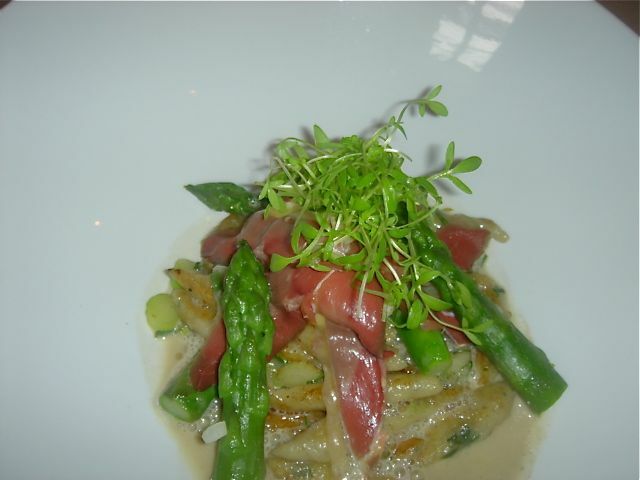 A farm fresh egg poached on a bed of spaetzle with green asparagus, thin slices of duck ham, and a saucing of black truffle coulis. John was one happy camper and I didn’t need to take a bite since this was to be my second course. 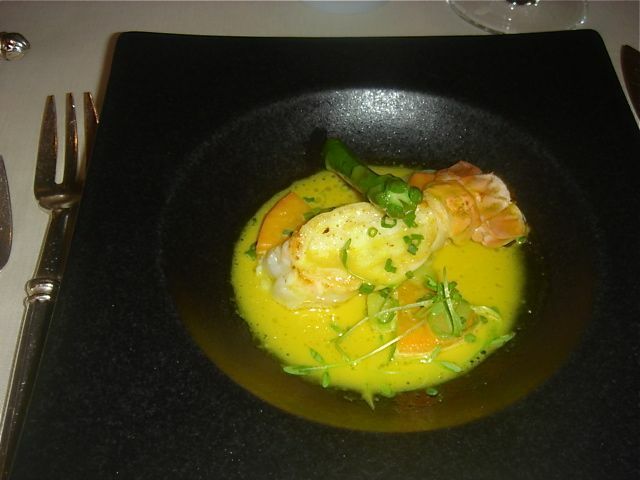 Grilled langoustines [a la plancha] with curry sauce, asparagus, and squash. Another winner. 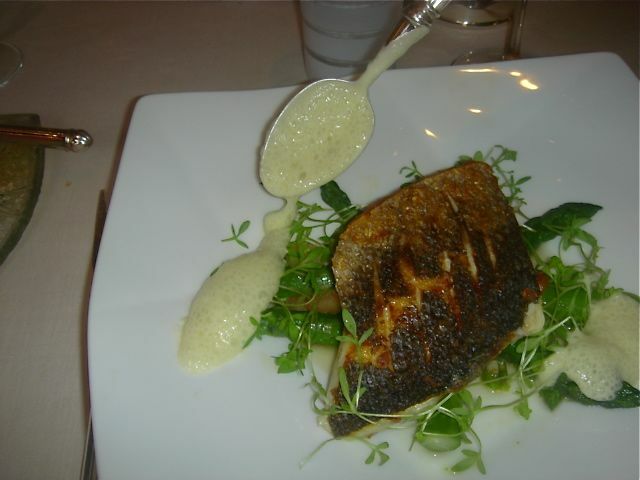 John-roasted sea bass [a la plancha] with asparagus, fava beans and hollandaise foam. The chef uses olive oil to make his hollandaise. In fact, he uses quite a bit of olive oil instead of butter as he finds it lightens his dishes and the customers really like it. 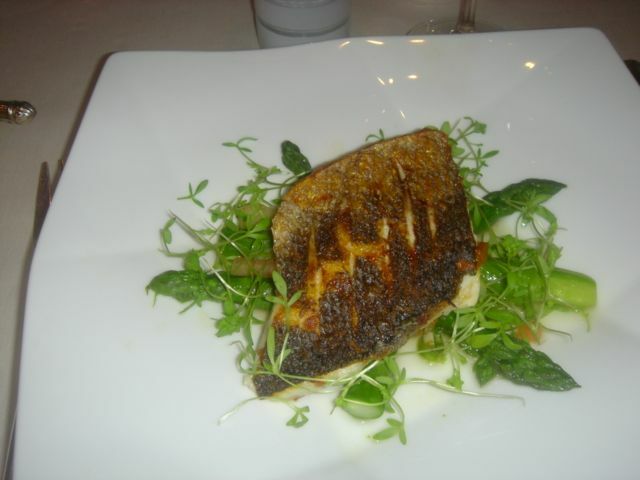 The sea bass skin was crispy and roasted to perfection. 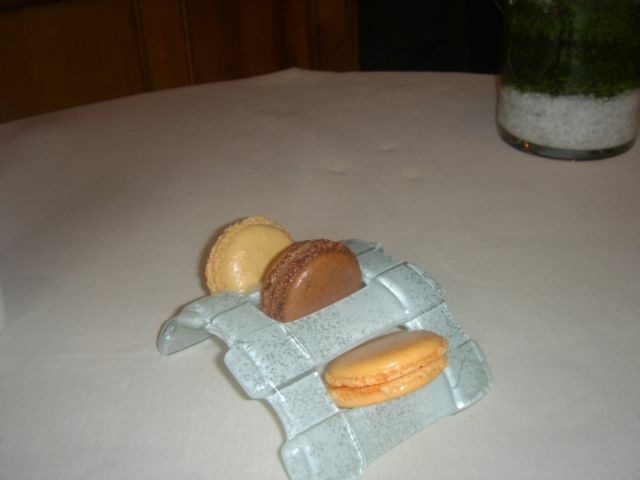 As an aside, the chef’s sister and her husband have a restaurant in Nice, La Merenda. It is run by Daniele and Dominique le Stanc, the former chef at Chantecler. The restaurant has no phone and accepts cash only. It is very popular, very small and you walk in to reserve a backless stool – the only seating. 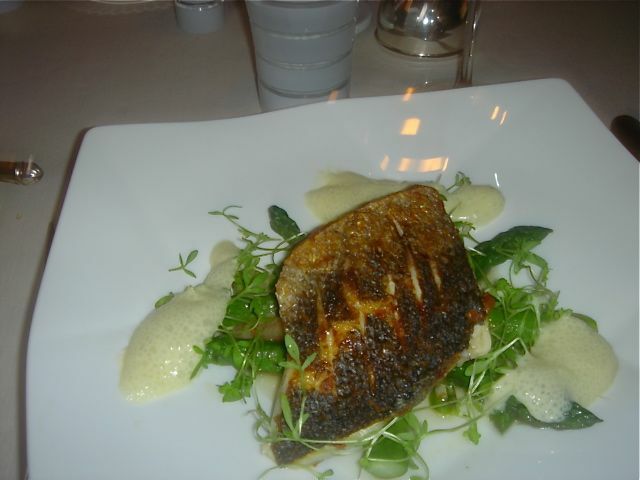 2003 Riesling Laugel Attenberg de Bergbieten–excellent accompaniment to good food and great service. We were not expecting this type of experience at Le Cerf at all. Best advice – ignore all the naysayers–this is a chef who is dedicated to revitalizing his family’s restaurant. The staff has many young enthusiastic men and women. They are excited about what is going on. People all around seemed to be enjoying themselves. Please let everyone know that Le Cerf is definitely a destination restaurant. It deserves to be.